"Portrait of a Chamorro Woman - Violet"
Paul Jacoulet, November 30, 1934. 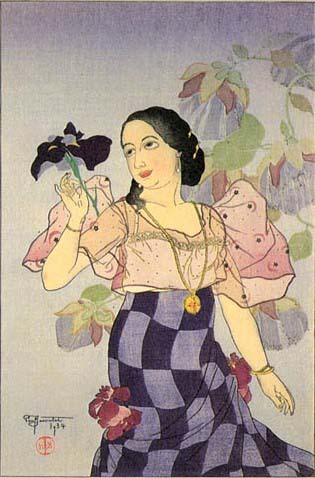 Jacoulet's images, though painted in the 1930s, nonetheless capture the Spanish influence on Chamorro culture. The Chamorro population was just undergoing a huge decimation when they built the church in Inarajan about 1680, Larry remarks. About 1700 or so, about 1710, thats when the population reached a low. Some of this was due to warfare, but mostly it was due to introduced diseases to which the Chamorros had no immunities." Even before San Vitores, there had already been a problem with disease, Anne elaborates. People were already dying. But during San Vitores four years, and then during the wars, the problem of diseases increases. Theres a lot of debate about what the population was, because San Vitores said it was 100,000 and more modern scholars have tried making their own guesses. The Spanish themselves didnt really have a good accounting of how many people were dying in any village. They do mention that diseases are killing people, but you never have a sense of the numbers." "The historical accounts are all based on Spanish records, and I dont know how much we can really trust their records when theyre really seeing the death of so many people. But perhaps 90% of the population dies off in a 30 year period, and this is happening only 50 to 100 years after the Caribbean had gone through a similar decimation. "I think we cant even imagine the psychology of the time and what would have been like when 90% of the populationalmost everyone you knowis gone in a 30 year period. Its an extreme trauma. And at the same time, the Spanish are also resettling everyone, moving people around." Photo courtesy of the Guam Museum. 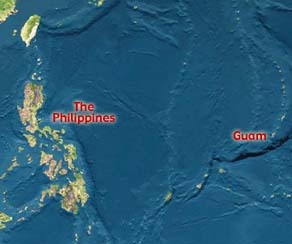 Guam and the Philippines were both under Spanish control. 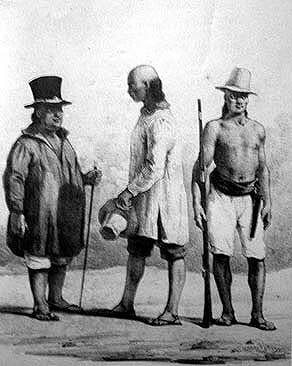 "Filipinos and Mexicans were brought to the island as soldiers. And then you have the priests and the high-ranking government officials who were primarily Spaniards, either from Spain or from Mexico. But most of those people were either in Hagatña or in Umatac. They werent really roaming the island. And the Spanish actually attempted to keep the Filipino and the Mexican soldiers away from the Chamorros. They wanted to keep these groups apart because they feared that if there was a native uprising, the Filipinos and the Mexicans might be more sympathetic to the Chamorros, and the Spanish didnt want to test their loyalties. "Also if they started marrying, their loyalty to the Spanish crown was not going to be as strong as their loyalty to their new families. The Spanish wanted to protect themselves." Source:Data compiled by Dr. Anne Perez Hattori. Today everyone says if you just look at the names, you get the sense that there were a lot of Filipinos, and there were a lot of Spaniards. But we dont know very well how the naming occurred, because the ancient Chamorros didnt have last names. So how do they make this transition to all of a sudden having last names? How does Quipuhá's generation all of a sudden get last names? "We have some indications that priests gave names when they baptized children, Christian last names like Cruz which means cross, Santos means holy, San Nicolas was a common name the priests apparently just gave children. Apparently some Spaniards were giving names to some of their maids or house workers, Chamorros who worked with them a lot. They sometimes gave them names, kind of as a reward: You were such a good worker, Im going to give you my Spanish name. At the same time, theyre promoting the mentality that this increases your status. You have a connection to the Spanish realm, you have a connection to Spanish blood, so you are a higher rank." 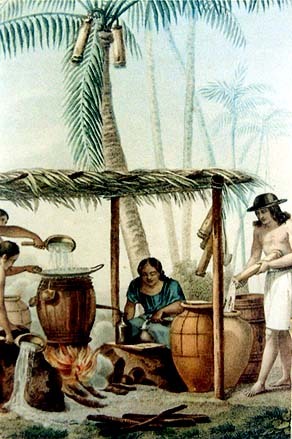 Distillery making aguayente, a strong liquor made from tuba, a coconut-based alcoholic drink. Photo courtesy of the Guam Museum. Mayor, peasant and hunter of Umatac. 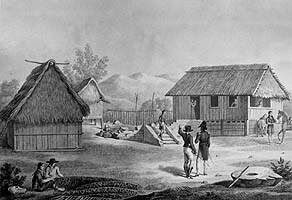 Likewise after drawings from the D'Urville expedition, 1828. If you just look at the population, the numbers, there wasnt a huge influx of single Filipino and Spanish men migrating in, and even if they are, theyre coming over for 18 months to two years. Theyre here doing work for the military. Theyre not really coming to Guam looking for wives. Plus the Chamorros are mostly not really a part of the whole Spanish lifestyle, especially for those outside of Hagåtña. Its a real segregation. So definitely there was intermarriage, but if you look at the population records, there was never a huge influx of Filipinos until the 1800s when the Spanish started bringing over political prisoners, the deportados, from the Philippines. Even then, I dont know how many of them stayed on, how many of them married. Its a very controversial topic." Changes in the population make-up on Guam was only one effect in the aftermath of colonization.